Looking For Free Condoms? There's A Health Department App For That : Shots - Health News State and local public health departments are turning to apps as to help them reach people when they need help the most. Birth control finders, recipe tweakers and searchable restaurant inspections are in the mix. Like radio, public health communication is all about figuring out how to connect with the audience. New York City is betting that if you're anticipating a night of adventure, you might make use of the Find Condoms NYC app. The app scans the New York Health Department's list of 3,000 sites that distribute free condoms, and uses a smartphone's GPS to list and map the five closest spots. In the moment, convenience counts. "Erm... Love this app," a reviewer writes on iTunes. "Great for those spontaneous moments when you just gotta have a free condom." Though health apps abound, most of them focus on diet or fitness. The small yet growing number of apps created by state and local health departments are different. Many put oodles of health data in a person's hand. Take, for instance, New York's Teens in NYC Protection+ app, which includes a database of health care providers that have been vetted by the city and by teenage secret shoppers. The goal is to help teens find free, confidential help preventing pregnancy and STDs — though pregnancy tests are provided, too. Several health departments offer mobile access to their databases of restaurant inspections, including Kern County, Calif.'s Safe Diner. Thanks to that app, I now know that Mom's Donuts and Chinese Food in Bakersfield is a safe bet. 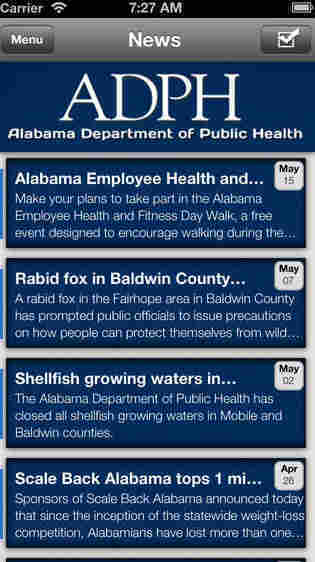 The state of Alabama took a different tack with its new app, which mirrors the state's Department of Public Health website and social media streams. It alerts the public to the fact that shellfish waters were closed in Mobile and and Baldwin counties on Aug. 19, due to possible bacterial contamination after heavy rainfall. But I expect if I were an oysterman or shellfish eater, I likely would have found that out more quickly some other way. New York's fourth and newest public health app, CalCutter, launched last week. It offers suggestions on how to reduce calories when cooking. But health-conscious cooks have to enter the ingredients and their amounts. Still, it might be worth it just for the opening screen, which declares "2,000 calories A DAY is all most adults should eat." Close my eyes, and I can almost hear Mayor Michael Bloomberg hectoring me. Next up for New York — a collaboration with celebrity chef Rocco DiSpirito, who will add his own take to the recipe-tweaking suggestions to CalCutter. But there are already plenty of books and websites on adapting recipes to make them healthier, including DiSpirito's own. It will be interesting to see how New York's foray into the realm of the Food Network will pan out. A hat tip to the fine folks at MobiHealthNews, whose review of public health apps got us downloading. Want more? The feds are into health apps in a big way. This portal lists them, including the National Cancer Institute's quit-smoking apps, the PubMed database from the National Library of Medicine (beloved by health reporters everywhere), and the spooky Radiation Emergency Medical Management. That app, designed for health care providers, offers guidance on treating "injuries patients may experience after a dirty bomb or nuclear emergency." Savvy practitioners might want to download in advance, the app notes, "so that it is accessible during an emergency if the cell phone networks are down."